Update: Verizon has responded to our inquiry about the Nexus 7 LTE registration issues. 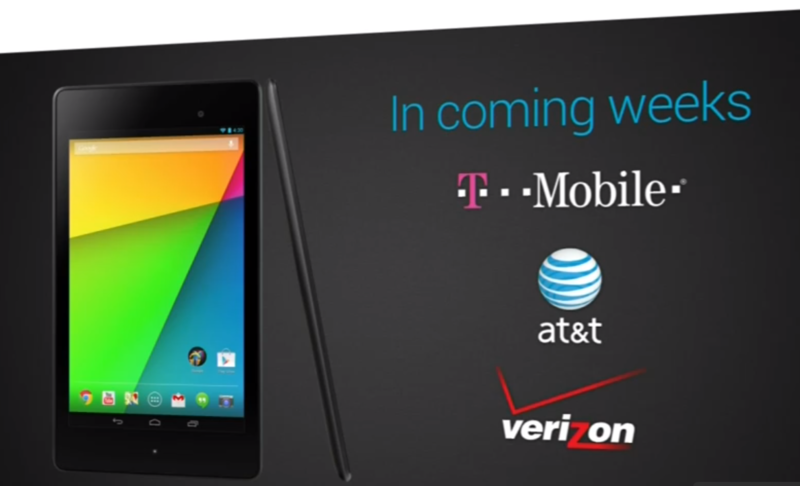 A company representative said that the Nexus 7 LTE would be certified for the Verizon network at some point. That isn't much to go on, but it's certainly promising - it implies that Verizon is at least aware of the problem and taking steps towards upgrading the company's infrastructure to compensate. Of course, it could take any amount of time for Verizon to certify a new, unlocked device for their network (and Verizon isn't exactly known for speedy response when it comes to devices and software). Verizon will need a some kind of system for allowing unlocked devices eventually - see the Block C LTE requirements below. Here's hoping that the availability of a reasonably popular unlocked LTE tablet makes them accelerate whatever plans they may have had. We'll be keeping an eye on the situation, of course. The new LTE model of the Nexus 7 2013 is compatible with AT&T, T-Mobile, and Verizon LTE bands. Which is great, especially for Verizon customers who want a Nexus device and haven't had any new options for almost two years. But there's a huge fly in the ointment: Verizon doesn't want the device on their network. At all. The company is refusing to open new data lines activated with the unlocked, LTE-only Nexus 7. Let's take a look at the technical side of things before we continue. The Nexus 7 LTE is a GSM-LTE device - it will work on the 3G GSM bands of AT&T and T-Mobile, plus the LTE bands for both carriers. Verizon's network is a hybrid of the older CDMA standard and the newer LTE standard, which is based on GSM technology. That's why LTE-capable Verizon phones use a SIM card whereas earlier 3G-CDMA phones didn't, and had to be individually activated on the network. Google and ASUS decided to work around this with the Nexus 7: it includes the LTE bands for Verizon but no CDMA radio. That means that the Nexus 7 LTE works on Verizon's LTE network (but not the older 3G network) with a Verizon SIM card. Take a SIM from any currently-activated Verizon device, throw it in the Nexus 7 LTE, and it will have data access. Unfortunately, Verizon is still clinging to its older business model when it comes to actual device activations (which in this case means SIM cards as well). Apparently Verizon lacks the infrastructure to activate a new device/data line on an LTE-only device without a legacy CDMA radio and the corresponding ESN or MEID identifier. This shouldn't be that much of an issue: paying or prospective Verizon customers should be able to call Verizon or walk into a Verizon retail store to set up a new data line, right? Plenty of customers have been able to swap SIM cards from "legitimate" Verizon devices into the new Nexus 7 and have it work without issue. That would seem to suggest that any Verizon employee could set up a new line with, say, a demonstration tablet, then give the SIM card to a customer. There may be corporate policies that are preventing this from happening, and at least one user on the resulting Reddit thread claims that a Verizon employee refused to sell him data service and the SIM card to use it. Another user claiming to be a Verizon representative says that the limitation is a technical one (despite the seemingly flippant response above) resulting from the Nexus 7's lack of an ESN. Obviously this is a big blow for Verizon customers, but it's a major headache for Google as well: the LTE version of the Nexus 7 2013 has been promoted as Verizon-compatible since the announcement event. There are also some legal issues for Verizon: as part of the conditions of the company's purchase of the Block C LTE spectrum, they are required to allow customers to access to the network on any compatible device. Verizon may be able to stall on this point, since it's technically possible to use the Nexus 7 LTE on Verizon, and they aren't legally required to allow non-Verizon devices until they implement voice services over LTE. And the "open access" provisions of that sale are something that Verizon has publicly denounced, and the company's compliance doesn't mean what some power users may wish that it means. There is also a network security provision that could mean Verizon is free to refuse any individual device, including those that lack support for its legacy authentication systems. So what can you do if you're a Nexus 7 LTE owner who can't activate a new line? Aside from switching to a less draconian carrier, you can try your luck at a retail store. Licensed resellers (non-franchised brick-and-mortar stores, or the phone sections of department stores) may be more eager to activate a new line via the swapping method, regardless of a device sale or compatibility. We've reached out to Verizon representatives for comment. At the time of writing, the company has made no official statement on the matter... unless you count the tweet above.